"On the last day of January 1915, under the sign of the Water Bearer, in a year of a great war, and down in the shadow of some French mountains on the borders of Spain, I came into the world." 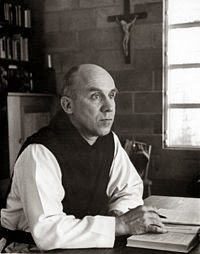 I had heard many stories about Thomas Merton, the "Buddhist Trappist monk" and I was interested in finding out the commonalities he discovered between Buddhism and Catholicism. However, as it turns out, The Seven Storey Mountain is an autobiography of Merton's early life, before he converted to Catholicism, and covering a few of the years after he entered the Trappist monastery, so I'll have to search further to read about the Buddhist-Catholic component. Nevertheless, this book, which was featured in the National Review's 100 Best Books of the Century, was charming, funny, heart-warming, spiritual, serious, emotional and intellectual. "On the last day of January 1915, under the sign of the Water Bearer, in a year of a great war, and down in the shadow of some French mountains on the borders of Spain, I came into the world. Free by nature, in the image of God, I was nevertheless the prisoner of my own violence and my own selfishness, in the image of the world into which I was born. 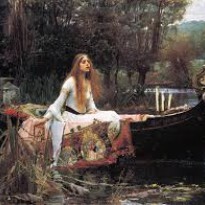 That world was the picture of Hell, full of men like myself, loving God and yet hating Him; born to love Him, living instead in fear and hopeless self-contradictory hungers …… My father and mother were captives in that world, knowing they did not belong with it or in it, and yet unable to get away from it. They were in the world and not of it ------ not because they were saints, but in a different way: because they were artists. The integrity of an artist lifts a man above the level of the world without delivering him from it ……… I inherited from my father his way of looking at things and some of his integrity and from my mother some of her dissatisfaction with the mess the world is in, and some of her versatility. From both I got capacities for work and vision and enjoyment and expression that ought to have made me some kind of King, if the standards the world lives by were the real ones. Not that we ever had any money; but any fool knows that you don't need money to get enjoyment out of life." From Merton's early life in France, we move with him to America and then, after the death of his mother, his return to France with his father, while his brother, John Paul, is left behind with his grandparents. When Merton is 13 years old, they move to England, but when his father dies of a brain tumour, he eventually moves to the U.S. again, and finds himself enrolled in Columbia University, on his way to a possible promising professorship. Yet life intervenes and through various circumstances, Merton finds the church and from there, a personal relationship with God. Merton was not a man who was searching for an escape from life. Fascinatingly, he did not find the monastery; the monastery found him. Initially, as a young man, his life consisted of university, friends, bars, girls and fun. Calling himself a true child of the modern world, he was a mirror of its afflictions: selfishness, ambition, irreligion, materialism, etc. His expectations were to graduate and find employment, as other young men in his situation. Yet within the social activity and superficial amusements that he experienced as a typical American youth, he nevertheless felt an emptiness that came with an increasingly strong desire to be filled. Perhaps Merton had tried it all and the only thing left was God. "'France!' I said, in astonishment. Why should anybody want to go to France? I thought: which shows that I was a very stupid and ignorant child." "The rest of the time was one long fight. We fought on pleasure steamers, we fought on funicular railways, we fought on the tops of mountains and at the foot of mountains and by the shores of lakes and under the heavy branches of evergreens ……………. By the time we got to the Jungfrau koch, everybody was ready to fall down from nervous exhaustion, and the height made Bonnemaman faint, and Pop began to feel sick, and I had a big crisis of tears in the dining room, and then when Father and I and John Paul walked out into the blinding white-snow field without dark glasses we all got headaches; and so the day, as a whole, was completely horrible …………… John Paul humiliated the whole family by falling fully dressed into a pond full of gold-fish and running through the hotel dripping with water and green-weeds." Merton's deep understanding of human nature is punctuated by intelligent comments throughout the book. On school: "But when a couple of hundred of these southern French boys were thrown together in the prison of that Lycée, a subtle change was operated in their spirit and mentality. In fact, I noticed that when you were with them separately, outside of school, they were mild and peaceable and humane enough. But when they were all together there seemed to be some diabolical spirit of cruelty and viciousness and obscenity and blasphemy and envy and hatred that banded them together against all goodness and against one another in mockery and fierce cruelty and in vociferous, uninhibited filthiness." On literature: "A course in literature should never be a course in economics or philosophy or sociology or psychology …….. the material of literature and especially drama is chiefly human acts --- that is, free acts, moral acts. And, as a matter of fact, literature, drama, poetry, make certain statements about these acts that can be made in no other way. That is precisely why you will miss all the deepest meaning of Shakespeare, Dante, and the rest if you reduce their vital and creative statements about life and men to the dry matter-of-fact terms of history, or ethics, or some other science. They belong to a different order." On capitalism: "It is true that the materialistic society, the so-called culture that has evolved under the tender mercies of capitalism, has produced what seems to be the ultimate limit of this worldliness. And nowhere, except perhaps in the analogous society of pagan Rome has there ever been such a flowering of cheap and petty and disgusting lusts and vanities as in the world of capitalism, where there is no evil that is not fostered and encouraged for the sake of making money. We live in a society whose whole policy is to excite every nerve in the human body and keep it at the highest pitch of artificial tension, to strain every human desire to the limit and to create as many new desires and synthetic passions as possible, in order to cater to them with the products of our factories and printing presses and movie studios and all the rest." Through his writing, Merton's connection with the outside world was only enlivened and strengthened after he entered the Trappist monastery. Most of his most vibrant and inspirational work was produced while he was cloistered, as if being in the world made him understand it less, but by being removed from it, he gained a greater understanding. While his post-monastery accomplishments were vast, he initially felt the vocation of a writer in conflict with his vows, but under the urging of his abbey superior, he became a prolific author, producing more than 70 books on spirituality, social justice and pacifism, and The Seven Storey Mountain gained him a world-wide reputation. He became more interested in inter-faith dialogue and amassed a huge correspondence with a great number of influential people. In 1968 he attended an inter-faith conference for Catholic and non-Christian monks in Thailand, and, after stepping out of the bathtub in his hotel room, Merton was accidentally electrocuted by touching an electrical fan. He was 53 years old. Upon its publication, The Seven Storey Mountain won critical acclaim, appealing to a post World War II society looking for meaning and stability. Grahame Greene had high praise for it, saying: "Is is a rare pleasure to read an autobiography with a pattern and meaning valid for us all. The Seven Storey Mountain is a book one reads with a pencil so as to make it one's own." 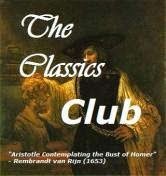 By 1984 it had sold 3 million copies, and to-date is in continuous printing and is published in 15 different languages. The value of a book such as this is that it takes you out of life as you see it from your own perspective. Like it nor not, society influences our thoughts, our choices, our perceptions and our actions. We often see situations from one vantage point and must struggle to get a different view. Merton starts with the familiar, living the status quo, but then takes you out of the normal, the complacent, the mundane, and allows you to see life from a completely different aspect. The door is open and you are free explore. I'm looking forward to reading more of Merton's work. He examines so many fascinating ideas in so many different areas, and really gets me thinking. And I actually finished my Classic Club Spin #5 so I'm going to celebrate! Yay!